Two men are in the hospital following a shooting early Sunday at a Knights of Columbus Hall in Opelousas, La. A woman was critically injured after being shot in the chest by a stray bullet that came into her Whites Creek, Tenn., home Sunday night. A bullet pierced the walls of a Forrest City, Ark., home and hit a woman in the knee Sunday night. via The Weekend in Gun Violence – NYTimes.com. A 15-year-old girl was accidentally shot and killed after she and her 12-year-old sister were handling a .380-caliber semi-automatic handgun in their LeFlore County, Miss., home Sunday. A 41-year-old woman was killed and five others were wounded when Esteban Smith, 23, who was stationed at Camp Lejeune in North Carolina, randomly fired at vehicles as he drove around Concho County, Tex., in his pickup Sunday afternoon. A 15-year-old girl was accidentally shot in the face by her father, 38-year-old Matthew Holmes, who took out his 9mm while visiting friends in Honesdale, Pa., Saturday night. 1-year-old Carter Scott was killed and his father, Rashaw Scott, 22, was wounded when three people opened fire as they sat in a parked car outside an apartment complex in Cherry Hill, Md., Friday evening. An 11-year-old Homestead, Fla., boy who brought a gun to school was shot in the leg and wounded after it accidentally discharged inside his backpack. Keshawn Carter Davis, 12, was accidentally shot and killed inside a Greenville, N.C., home Friday morning. A 15-year-old was driven to the hospital and left there by his family after he was shot multiple times and wounded at his Richmond, Va., apartment Thursday night. Tonquinisha “NeNe” McKinley, 17, was killed and Uniqua Wicker, 18, Raven Howard, 19, and Pamela Jordan, 39, were wounded when gunfire erupted at an unofficial Saginaw High School pre-prom gathering in Saginaw, Mich., Thursday night. Open water swimming is a challenge and a wet suit definitely makes it easier. My mother used to swim 10 miles out and ten beck in Providence, RI in the 1930s and kept up until in her early 60s. Last week, Prime Minister Ismail Haniyeh of the Hamas government in Gaza called on Egypt to revise the Camp David Accords, which were signed with Israel. His speech came after the kidnapping and later release of Egyptian security personnel in Sinai by radical jihadist groups. The debate about the peace treaty with Israel is not new. It is as old as the treaty itself. The recent deterioration of security in Sinai, however, particularly after the ouster of the Mubarak regime, has reinvigorated the debate about the Camp David Accords. This is especially the case regarding amendment of the security arrangement in Sinai. Planting genetically engineered plants – even for tests – is prohibited in Germany. Only two products – Monsanto’s MON 810 corn and the Amflora potato of the German company BASF – are licensed to be grown in Europe. There’s not much acreage under GMO crops, at least compared to North and South America. At first, many US farmers were thrilled by the economic success Monsanto promised. The genetically engineered plants and matching chemicals ensured large harvests with little effort. The drawback was that every year, the farmers were forced to buy seeds to grow the next crop – Monsanto regards replicating the seeds as infringing on its patent. Another drawback, Töwe says, is a massive increase in resistance: pests and weeds are on the rise, making new pesticides necessary. via Saying ‘No’ to genetically modified food | Europe | DW.DE | 28.05.2013. The Bay Area Rapid Transit system’s board of directors voted to let commuters bring bicycles on all trains, even during rush hour, starting July 1.
via Bicycles OK on all BART trains all the time starting July 1 – San Francisco Business Times. This final rule amends the exemptions (uses) for one substance, peracetic acid, for organic crop production. This final rule also amends the exemptions for three substances used in organic handling: potassium hydroxide, silicon dioxide, and beta-carotene extract color. via Regulations.gov – Rule Document. Even Ladybugs can be an invasive species and unintentionally kill native ladybugs! 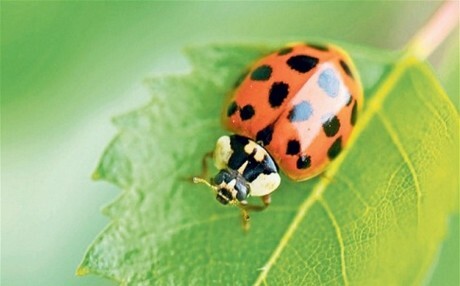 The harlequin ladybird was once a stalwart ally of greenhouse owners around the world. Native to Japan, Korea and other parts of eastern Asia, the bright red beetles were prized for their aphid-eating abilities – until they caused serious declines in other ladybird populations. Now, researchers have discovered the harlequin’s secret weapon: a deadly parasite that lives harmlessly in its body but kills other species with abandon. The findings, published in the journal Science, demonstrate how things can go awry when a foreign creature is introduced into an ecosystem, even when done with the best intentions. Ladybirds are beloved by humans and are valuable to gardeners, who deploy the spotted beetles to eat plant-munching aphids rather than spray their shrubs, flowers and crops with harsh chemical pesticides. It is a prime example of an environmentally friendly agricultural practice known as biological control. But one particular ladybird – the harlequin, or Harmonia axyridis – has proved to be a two-faced friend. The bugs gobble up aphids at jaw-straining speeds, but spread like wildfire once they escape the greenhouse, quickly taking over native ladybirds’ turf in large parts of Europe, North America and other regions. In Europe, swarms of the pests have started taking wintertime shelter in houses, said study co-author Heiko Vogel, a biologist at the Max Planck Institute for Chemical Ecology in Germany. The residence of Vogel’s own mother has been plagued by the beetles, which can fly through windows, slip under carpets and burrow into any crevice a human home has to offer. “Thousands of beetles – even if they are nice-looking – crawling into your house is not fun,” Vogel said. German researchers analysed the harlequin ladybird’s haemolymph – its blood, essentially – under a microscope and found extremely high spore counts of a single-celled fungus related to the parasite Nosema thompsoni.